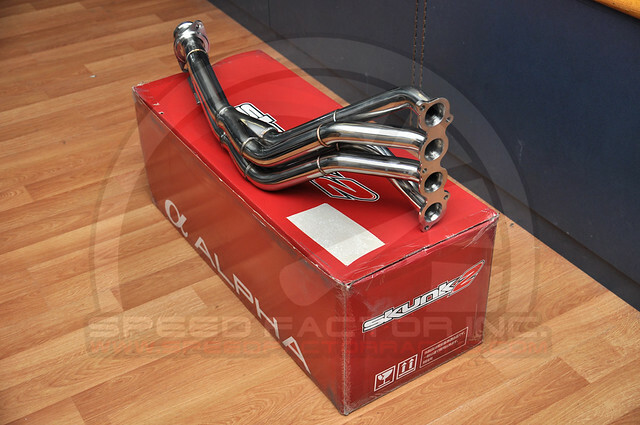 Skunk2 is proud to announce its all-new Alpha Series Header for the ’06-’11 Civic Si. Patterned after our already popular and dyno-proven MegaPower Headers, which have been used by leading, competitive race teams for years, Skunk2’s Alpha Series Header employs many of the same design characteristics and technology. Our decision to produce the Alpha Series Header was driven by our desire to make our race-proven design more affordable and accessible to everyday enthusiasts. New manufacturing techniques allow us to do so at a lower overall cost, making race-winning header technology available to everyone. Skunk2’s Alpha Series Header for the eighth-generation Civic Si offers Skunk2 performance, industry-leading customer service, and a full warranty policy, all at a price comparable to lesser budget-minded headers. Unlike the budget-minded headers, though, only Skunk2 Alpha Series Headers ensure precise fitment and the peace of mind of knowing that a Skunk2 representative is just a phone call or email away. All Skunk2 headers are designed and engineered to maximize exhaust flow and increase both horsepower and torque throughout the powerband. The unique design is the result of more than a decade of racing experience coupled with computerized modeling and extensive dyno testing. Each Skunk2 Alpha Series Header features equal-length, sequentially paired, stepped primaries and a 4-2-1 tri-Y design that terminates into a collector with a 2.5-inch outlet. These features, paired with Skunk2’s unique design specs, provide an extremely broad powerband that’s applicable to a wide range of engine sizes and configurations. Alpha Series Headers also feature the smallest possible primary tubes required to achieve optimum overall and peak power. By minimizing the primary tubes’ diameter, Skunk2 is able to maintain the highest possible exhaust gas speed throughout the header, which improves mid-range power and throttle response significantly. Skunk2’s Alpha Series Header provides the perfect combination of top-end power without sacrificing mid-range performance or throttle response. Now in stock at Speed Factor!